Suggested by Hugo Noth, the work was written in the months September, 1985 to January, 1986. Starting from a gesture based on four notes, string quartet sounds in eight parts are created. Various forms of call alternate with constantly recurring sound pictures and short melodic passages. An extended cadenza for accordion, which seeks to bring the diverse musical materials into relation with each other, is set against chord blocks in the strings. With penetrating repeats, the movement ends in a triple forte. II. The Lamentation stands in strong dynamic contrast to the preceding movement. The glissando capability of the accordion is linked to glissando techniques in the strings. The attention is centred on the increasingly powerful large-scale structures over an ostinato bass line in the accordion. After the climax (at the sectio aurea), the dynamics fall away rapidly; the atmosphere of the opening is felt again briefly and fades after a few bars. After a short introduction in restrained tempo, a virtuoso vivace dominates the events in this movement, which, repeatedly interrupted and formally subdivided by tango rhythms, short chorale-like ideas and cautious melodic sections, is finally led to a striking conclusion. I would be very happy if I succeeded with op. 85 in making a constructive contribution on the theme of chamber music with accordion. Then the "lollipop" amongst the eleven first fruits was served. In the "Tripartita" for String Quartet and Accordion, Bertold Hummel extracts from the four notes b flat, a flat, d and e eight part sounds for the strings in superimposed layers of sixths. Alongside this, the accordion constructs melodies from the same material. With refinement, Hummel brings the two worlds of sound into constantly new relationships. The piece ends strikingly after a final movement in virtuoso motion in scales and tremolos. "Tripartita" will certainly soon have a sure place in the repertoire for this combination of instruments. The times are past in which sonority was interesting so to speak only in its aggregate form; it has now become an important means of expression again, not an effect for its own sake in the cheap way practised by speculators calling themselves composers. 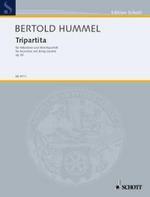 Bertold Hummel's "Tripartita" for Accordion and Strings, premièred by the "Joachim-Quartett" and Hugo Noth, exploits sonority in this new sense. In the second movement ("Lamentation"), glissandos are the magical means used to graft together these fundamentally different types of instrument. The work commences dramatically, intensifying the dialogue to a previously undreamed-of density and concentration. As in a kaleidoscope, expressive gestures and figurative ideas of compact dimensions clash with each other until near the end, as a fulminating last dance. Hummel certainly links his ideas to traditional formal structures; the musical language has an original effect, we are tempted to say "polyglot". The "Tripartita", received enthusiastically by the audience, proved to be one of the few valid works of chamber music for accordion which could be presented at this year's "Trossinger Musiktagen". Bertold Hummel's "Tripartita" captivated with its coherently interconnected "call" ideas, a middle movement based on glissando passages and a final virtuoso movement with different rhythmic and melodic elements. Hummel has written music to get hold of, immediately followable and comprehensible.